Cole seems shocked to see the news. Keselowski2Wallace, Tetronix and Shockey Rai like this. Either that or he has seen something he’ll never unsee. "NASCAR’s Scott Miller says the sanctioning body is considering much harsher penalties for next season, including taking wins away. Officials will take a look at the so-called “deterrence model” in the offseason and decide what to do." NascarMan32, USSTalladega, Riley Maddox and 8 others like this. GambitJon, NascarMan32, USSTalladega and 6 others like this. Finally. Stripping away wins along with all the points earned in that race (including stage points) will help crack down on this sort of hijinks we have been seeing this season with some of the teams (window braces "failing", tampered spoilers, illegal body modifications, illegal spitters, modified splitters, etc). They should make crew suspensions longer as well (no crew chief, car chief from 4+ races if you are busted by NASCAR for cheating like what Harvick's team did at Texas) along with stiffer points penalties (30 to 100 point penalties, depending on seriousness of rules infraction). Good on NASCAR for looking at bringing down the hammer on teams who try to cheat in such ways. USSTalladega, Virox6549, Keselowski2Wallace and 6 others like this. Makes me wonder though, would a sponsor value that added TV time in Victory Lane over their driver getting awarded a trophy midweek following a post-race inspection? They'd certainly be getting more TV time than anybody else, would that outweigh their driver being caught cheating? SpeedMaster14, USSTalladega, Keselowski2Wallace and 7 others like this. That...ACTUALLY sounds like a pretty cool idea tbh. Imagine it taking Las Vegas's spot in the west coast swing and you have Sonoma, ISM, & California (a.k.a. Fontana) all in that order, that's a really good stretch of West Coast races in my opinion. It kinda has a nice flow to it. Also, does this mean that if & when we go to Sonoma at that time frame, will the terrain be grass? I've seen footage from old races where they raced at Sonoma earlier on in the season and it would be lots of green grass surrounding the track due to the seasonal atmosphere of springtime. SpeedMaster14, Keselowski2Wallace, joeykraus19 and 2 others like this. I'm pretty sure they just let it die. It's all dirt tbh, there's not any grass on the track. Cindric to stay in Xfinity next season, albeit he's going to take over the 22 car full time instead of splitting it between the 22 and 60. "Austin Cindric full-time in Penske No. 22 Xfinity car next year ... The No. 12 Xfinity car will run on a limited basis with Keselowski, Logano, Blaney and Menard, according to news release. #nascar"
USSTalladega, joeykraus19, BrendonH12 and 1 other person like this. Good! 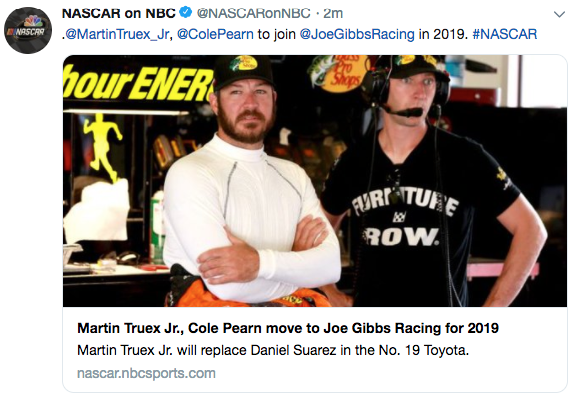 Its about damned time Penske had a Full-Time Xfinity driver again. Hoping they make some creative schemes with the bluish-green hue the brand has. Riley Maddox, ShadowKnight508, USSTalladega and 6 others like this. Well, that was a good 36 minutes of hope. I'll take it. Riley Maddox, joeykraus19, Shockey Rai and 1 other person like this. USSTalladega, BrendonH12, thedude1987 and 1 other person like this.